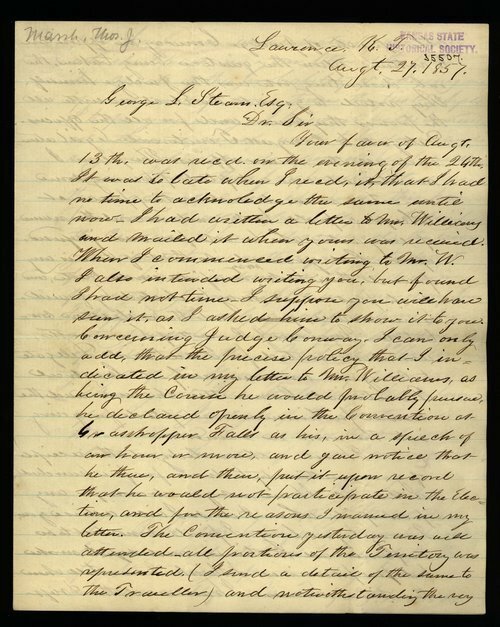 This letter from Thomas J. Marsh to George L. Stearns regards the political delegate convention in Grasshopper Falls, Kansas which, according to Marsh, was well-attended by all portions of the territory. The letter discusses preventive measures that the Free State party planned to take in order to ensure fair elections, including utilizing a poll book. Election fraud was common in the Kansas Territory as Missourians poured into the state on election day in support of proslavery legislators. The letter ends with a note claiming that Governor Charles Robinson gave Marsh $200 for the Free State cause, which was forwarded on by Amos Lawrence. A searchable, full-text version of this letter is available by clicking "Text Version" below.